This is Dennis (although she is a girl, her eyebrows reminded Sue of Dennis Healy). 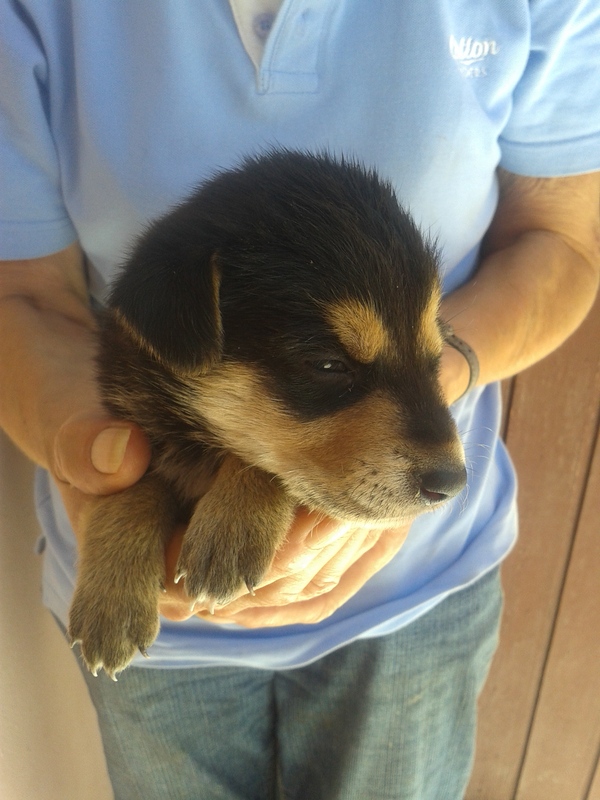 They are getting stronger and will soon be on solid food, and looking for good homes….. Anyone in Agadir, please share with your friends and acquaintances, in case they know anyone looking for a medium sized dog. This entry was posted in Animals on May 25, 2014 by ChristinaMaroc. 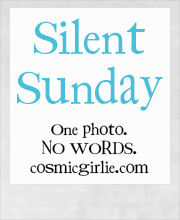 This entry was posted in Animals, Silent Sunday on May 25, 2014 by ChristinaMaroc. This entry was posted in Agadir, Agadir, Uncategorized on May 25, 2014 by ChristinaMaroc. This entry was posted in six word saturday on May 24, 2014 by ChristinaMaroc. 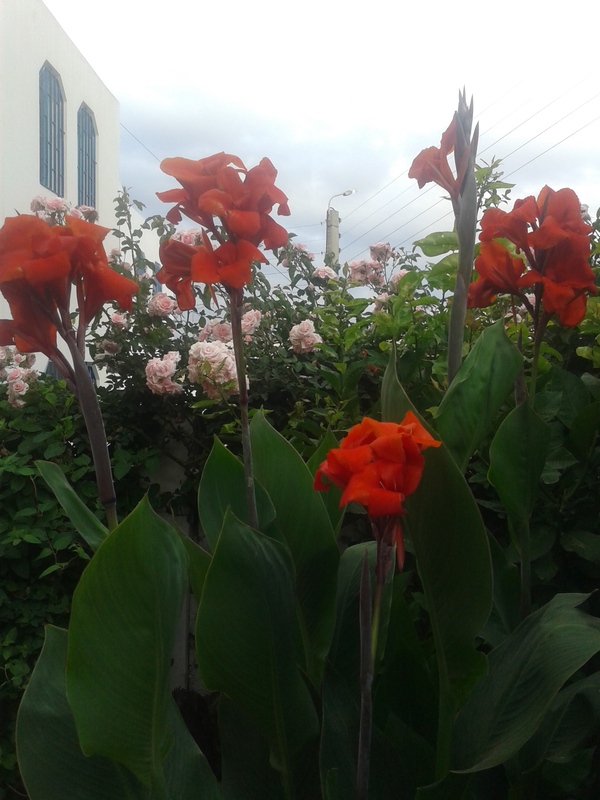 This entry was posted in Agadir, How does your garden grow on May 23, 2014 by ChristinaMaroc. For 18 months my dogs have played in the park daily with two gorgeous young street dogs who lived there. Six months ago they ate poison and almost died (the Local Authority’s way of controlling the number of strays here in Morocco is to put down poison). The Hobo’s managed to save them, and I and a friend started to feed them daily. Betsy had puppies recently, five died, and two were taken as pets by people visiting the park. Then Sissy had 8 puppies. Last week sadly both grown dogs were again poisoned, and this time died. So we were left with 8 three week old puppies. We started to feed them in the park, but then two disappeared and the Gardener said two young boys took them. At three weeks old and with no special knowledge, we felt sure the two babies would be dead by midnight. My friend decided to take the other six to her house to look after for a few weeks to get them stronger, and then we would return them to the park while also trying to rehome them to Moroccan families. We both feel strongly that the only way to change attitudes to animals is to get them into the community as pets. 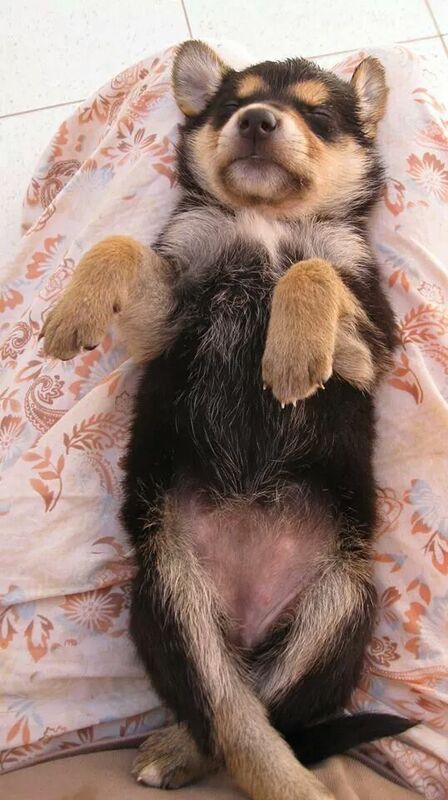 It is true that some people here hate dogs and some are very frightened of them, however, it is also true that there are many many Moroccans who are very kind to animals and tend to buy their puppies from puppy farms. We’d like to encourage them to take ‘Beldi’ (native) dogs. So today, after their foster mum had had a few days of hard work feeding and cleaning up after six puppies, we take our dogs to the park this morning, and there are the two missing puppies! Someone had returned them to the same place they were taken from, and in good health. So my friend takes the other two home…. 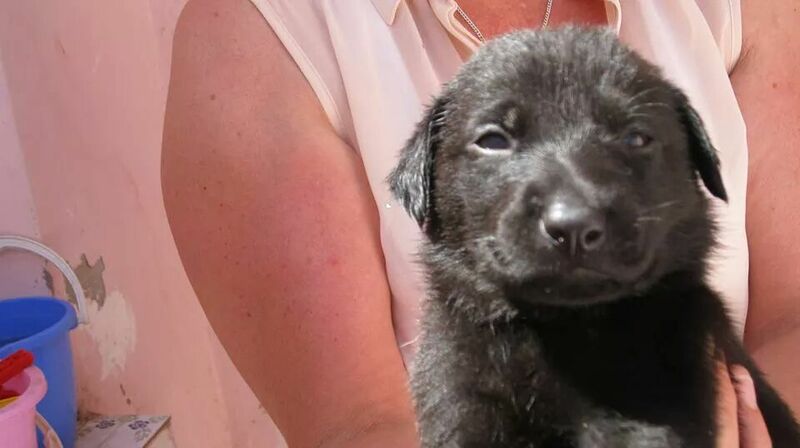 So today we have been bathing, combing, defleaing, feeding, and cuddling all 8 pups. Then we got the most amazing news, another friend has been talking to acquaintances and she has found a lady who lives in the Mountain who is interested in taking three pups. This is the most fantastic news, and gives us hope for good homes so we have decided between us to keep them until they are 8 weeks old. Hopefully we will have been able to rehome all, or most by then, and it will not be necessary to put them back in the park at all. 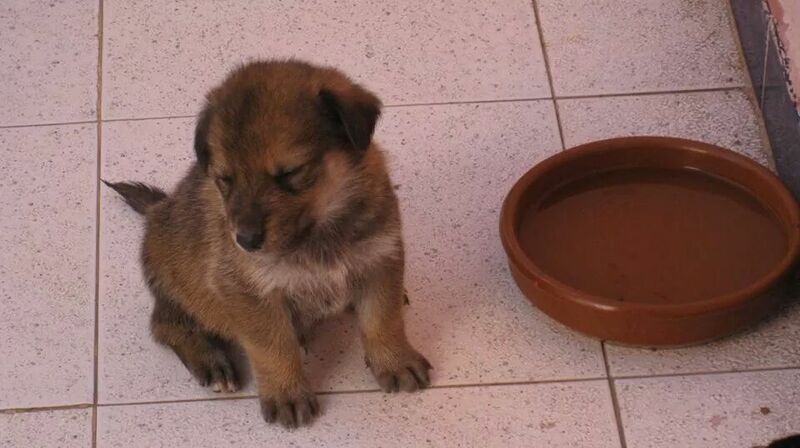 “These poor puppies have been left to starve on the streets of Agadir after their mum, Sissy, was cruelly poisoned! 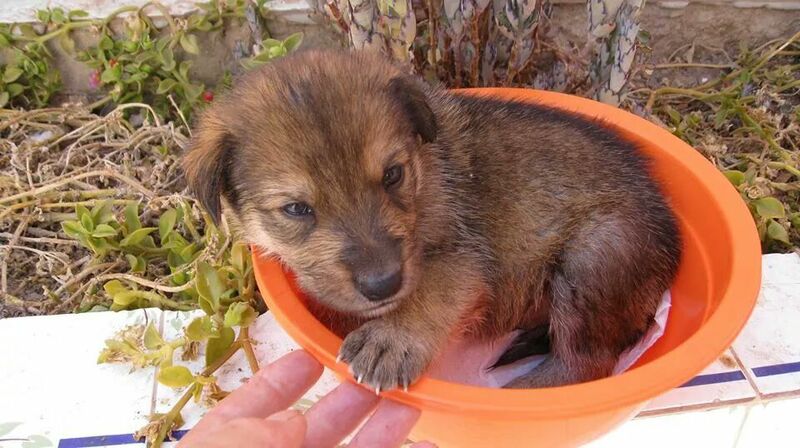 They are currently in the arms of a foster mummy but lets help get them fed, vetted and neutered. She has had orders from lovely people, giving us enough money to feed the pups for the next couple of weeks. Thank you all so much for making this even possible. This entry was posted in Agadir, Animals on May 20, 2014 by ChristinaMaroc. 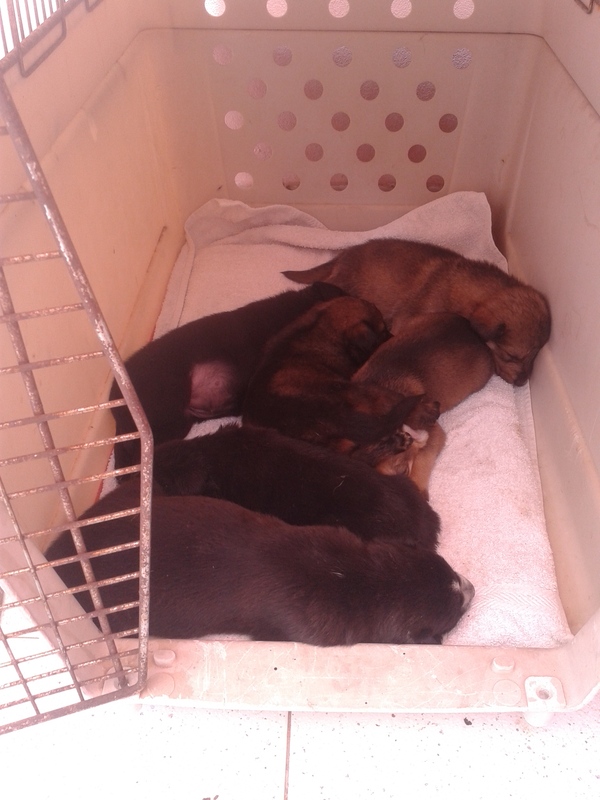 Six full contented puppies. I cannot believe how quickly they have perked up in four days. They have now started to play and are much more alert. Thanks to the generosity of friends we now have supplies for a couple more weeks’ food and special puppy milk. Their foster mum mixes them together to make a sort of gruel which they lap up, walk through, splatter and generally make a mess with! 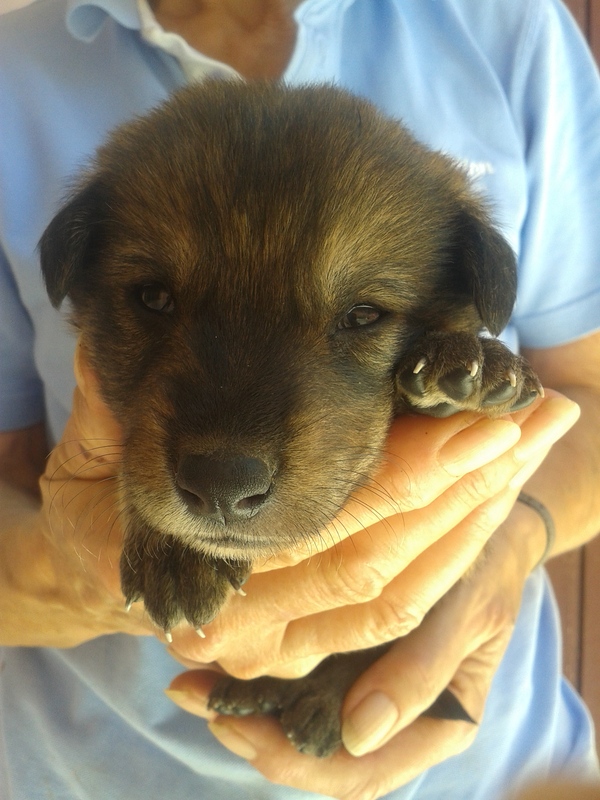 Agadir readers – they will be big enough to rehome in five or six weeks (Inshallah) so please talk to your friends, neighbours and acquaintances, anyone who might know someone who wants a dog! This entry was posted in Agadir, Animals on May 19, 2014 by ChristinaMaroc.